In Buddhism, Manjushri is the Bodhisattva of Wisdom, even if He is believed to have the enlightenment state of a fully enlightened Buddha. He bestows wisdom, intelligence, mastery of the spiritual teaching, the power of exposition, mental clarity, memory, and eloquence. More importantly, He is the principle patron and guardian of astrologers. Moreover, revered as the patron of arts and sciences (such as mathematics and logic), He is traditionally solicited by writers and poets for assistance. Authors often start their books with verses in Manjushri’s honor. Bodhisattva Manjushri belongs to the trinity of family protectors. The Buddha family that Manjushri is known for defending includes the first supreme Gautama Buddha Shakyamuni. 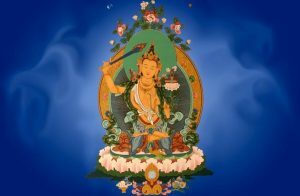 Of all of the known and acknowledged Bodhisattvas, Manjushri is the individual who is known for having the closest relationship and association with the Buddha Shakyamuni. Within Vajrayana Buddhism tradition, He is a powerful meditational deity and considered a fully enlightened Buddha. Furthermore, in Japanese Esoteric Buddhism tradition (Shingon Buddhism), Manjushri is one of the Thirteen Buddhas to whom disciples devote themselves. He appears extensively in many esoteric sacred texts such as the Manjusrimulakalpa and the Manjusrinamasamgiti. His consort in some traditions is Saraswati. 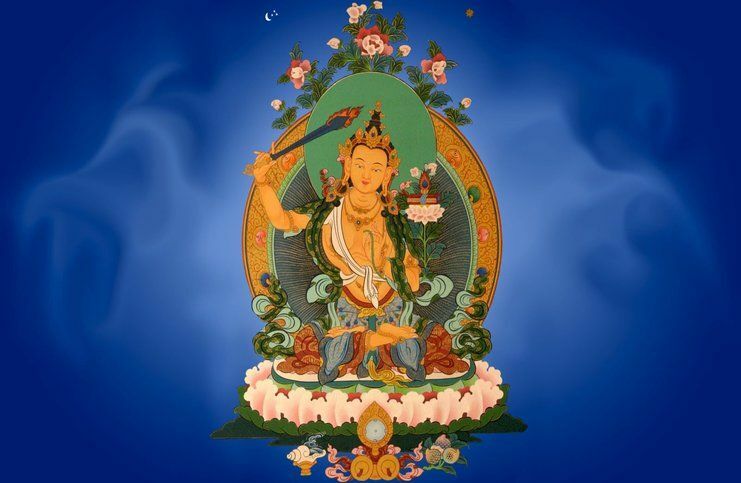 The Sanskrit name ”Manjushri” means „wonderfully auspicious” or „gentle glory”. the Bodhisattva is also known as „Lord of Speech” (Vagishvara) and as Manjughosha (which signifies „gentle-voiced-one” or „sweet-voiced-one”). He is commonly depicted as a male Bodhisattva handling a flaming sword in his right hand, which actually represents the supreme realization of transcendent wisdom which cuts down duality, suffering, and ignorance. The sacred scripture supported by the lotus (padma) held in his left hand is a Prajnaparamita sutra (the Perfection of Wisdom), representing Manjushri’s attainment of ultimate realization from the blossoming of knowledge and wisdom. In addition, He is often portrayed as sitting on the skin of a lion or riding on a blue lion. This represents the use of wisdom and knowledge to discipline the mind, which is compared to subduing or riding a ferocious lion. Syllable A guides to the ultimate insight that the essence of all things is unproduced. Syllable RA guides to the ultimate insight that all things are free and pure of defilements. Syllable CA guides to the ultimate insight that the arising and ceasing of things cannot be apprehended because in ultimate reality there is no arising or ceasing (of anything). Syllable NA guides to the ultimate insight that although the names for things change the nature of things behind their names cannot be gained or lost. The last syllable DHIH of the mantra does have a meaning, though this is not always the case with mantra sounds. This potent syllable has an extremely ancient connection with the manifestation of the form using sacred vibration or sound. This syllable also appears in the Rig Veda (Vedic Sanskrit hymns) where it stands for vision such as that preceding an intentional act of generation or creation. „If you chant this mantra daily in connection with this prayer; if you really focus, then your wisdom can improve within a month. In one month (if you practice daily and with a correct pronunciation) you can feel the difference in your intelligence, and your wisdom really expands. This is the mantra of Bodhisattva Manjushri.” – Geshe Rabten’s quote. RELATED POST What is the Meaning of Guru Rinpoche Mantra? At your heart is a horizontal moon disk. On that is a 6-spoked wheel, and at its hub is an upright orange seed syllable ”dhih.” Just above the wheel’s spokes are the syllables ”om ra pa ca na,” standing clockwise. Healing light emanates from the dhih syllable and the other mantra syllables. Practicing the mantra purifies your body and cleanses all negative karma (past deeds) and obscurations, especially those negative actions arising from ignorance, which ultimately leads to suffering. The darkness of ignorance is totally eliminated and the light of wisdom increases to illuminate all objects of knowledge. At the final part of the mantra chanting, imagine Bodhisattva Manjushri’s wisdom body appearing as a dhih lying on your tongue with its head towards the back of your mouth. More importantly, from the syllable dhih healing light rays emanate in all directions and converts into offerings – victory banners, protecting umbrellas, conches, jewels, and so forth – that are offered to all the Bodhisattvas and Buddhas. Their blissful infinite wisdom and knowledge and realizations manifest as red-yellow dhihs that absorb into the last syllable dhih on your tongue. This entry was posted in Buddhist Mantras on January 28, 2016 by admin.